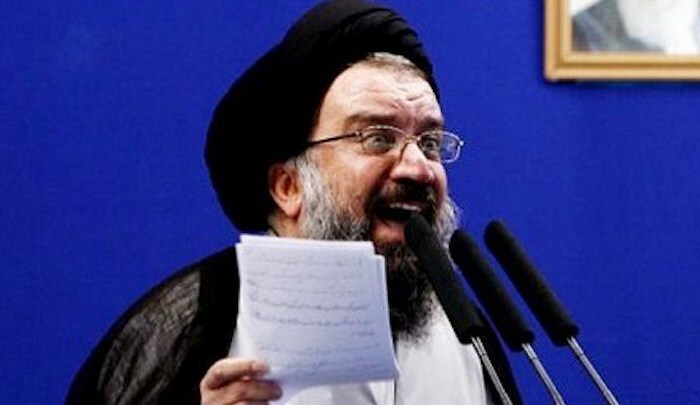 Jihad Watch : I have repeatedly said that the mullahs ruling Iran are not Iranians. They truly despise Iran and its glorious past. They even hate its name. There were never any questions about the Islamists denigrating Iran and exalting Muhammad. These creatures owe their very livelihood to the lucrative business that Muhammad launched for their parasitic shameful existence. It is vital for these leeches to continue trumpeting the sainthood of the founder of their business and driving all the competition out of business. Just recently, Sayyid Ayatollah Ahmad Khatami is a senior Iranian cleric, as well as a senior member of the Assembly of Experts, also, Tehran’s Friday prayer leader. He recently proved me right. Give this worm credit for paying homage to the source of his shameful livelihood. How dare the people of Iran even think to have a revolution or a referendum!! This government belongs to Imam Zaman (The Lord of the Age) and if anyone considers himself an Iranian, he needs to get the hell out of here. This soil belongs to us, the followers of Imam Zaman and his tribe. Iran’s name was created by ignorant people and incidentally, this name is very provocative. This ignorant name (Iran) must be changed to something like “Velayat” lest it provoke our enemies (Iranian people). The battle against these inhuman oppressors in Iran has been arduous and long. It the battle of the true sons and daughters of Iran and the rest of mankind. It remains our duty to work our hardest to remove these leeches from power.